I've written about buying local beer before, back when I named Saint Arnold my "local brewery." Well, I've found something even closer. According to Google Maps, Southern Star Brewing Company is located a scant ten miles from my front door, a couple minutes up Interstate-45 in Conroe, Texas. Besides my homebrews, I don't think I can get much more local than that. The company's signature brew, and the only one available in a non-keg format so far, is Pine Belt Pale Ale. The format is 16oz. 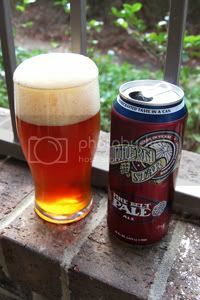 cans, the style is American Pale Ale, and the name is derived from the Pine Belt area here in Southern Texas. It's backbone is composed of Rahr Special Pale, Simpsons 30-37, and Crisp 45 malt varieties; while bitterness is provided by Sorachi Ace, Galena, CTZ, and Palisades hop varieties. The yeast strain used is California Ale. The beer is not filtered or pasteurized, so the motto on the can, "Clarity is overrated," really fits. Appearance: Pours a gloriously hazy honey body with a brilliant bubbly tannish head that leaves great lacing. In a couple of the glasses I enjoyed I found a lot of strange sediment, almost like tornado-shaped drops of oil in water, when I held my glass up to the light (see for yourself below). 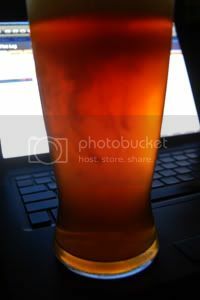 As I made my way through the beer, it ended up mellowing into a general coarse haziness. Aroma: Very Cascade-like notes of orange peel and grapefruit from the hops with a solid brown sugary pale malt baseline. Taste: Mildly bitter and piney hops lead the way with lots of caramely, slightly biscuity, pale malt underneath. Somewhat fruity. There's a lot of malt here for a Pale Ale, but everything tastes good together. Not tasting much of that 6.3% ABV advertised on the can. Mouthfeel: Medium bodied with average carbonation. Dries a little in the finish. Drinkability: Excellent drinkability, quite a thirst quencher. Just watch out for the 6.3% alcohol content, as smooth as this goes down it can sneak up on you. Verdict: To be honest, when I saw beer from Conroe in my local beer shop, I was excited, yet skeptical. But I'm happy to report that this beer is not only decent, but actually pretty damn good. They've crafted a very solid and balanced, somewhat malty, APA that drinks exceptionally well. I'll have to make the arduous ten minute journey up the road to tour the brewery sometime very soon.